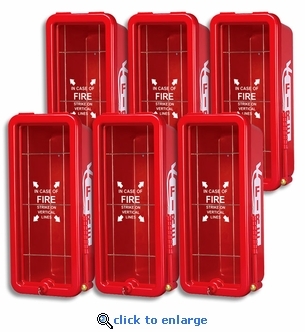 Save when purchasing a case of 6 FireTech™ Surface Mount Plastic Fire Extinguisher Cabinets. FireTech™ Fire Extinguisher Cabinets can be used indoors or out to protect your fire extinguishers and make them noticeable and easy to access. Constructed of high-impact polystyrene and ultraviolet inhibitors, these surface mount FireTech extinguisher cabinets will not fade, regardless of the weather or environment. Available in Red or White. Scored break front - Clear poly "glass" with silk-screened instructions. Cylinder lock with key - Non-corroding plastic. Break-front striker, molded plastic with brass striker. Color: Available in red or white. Select from dropdown above.